A new paper was published in Nature this week about the increase in global terrestrial gross primary production. Essentially it was about how there is a lot more plant mass on land than there used to be. The paper was from a team from France, the USA and Finland, led by J. Elliott Campbell from School of Engineering, University of California, Merced. (That should have got deniers gossiping, but it didn't). I don't have a copy of the paper yet, so I won't say too much about the work itself (I'll add more if I can get a copy, if it's much different to what's written below). Update: Got it now, thanks MS and JEC. What I can say is from the press releases, of which there are two that I'm aware of. The first is from the University of California, and is the one that Anthony Watts chose to copy and paste on his blog. The second is from the Carnegie Institution for Science, the home of one of the other authors, U. Seibt. The study not only confirms this, it demonstrated that climate model estimates are very close to what was observed through this research. The science is good. The authors made no predictions of future trends, but indicated there would be further research on the subject. The research was based on measurements of atmospheric carbonyl sulfide over the twentieth century, which is a different approach to some other studies, such as those analysing satellite images from different periods (e.g. pixel counting). The team made use of previous work showing that the concentration of the atmospheric trace gas carbonyl sulfide can be used to infer the level of global photosynthesis. They constructed a history of its concentration using air trapped in Antarctic ice and snowpack for centuries, infrared spectra of the atmosphere taken by astronomers since the 1970s, and data from a National Oceanic and Atmospheric Administration greenhouse gas sampling network, which began monitoring carbonyl sulfide in the late 1990s. The results show that global photosynthesis was stable for hundreds of years before the industrial revolution, but then grew rapidly throughout the 20th century. The recent increases in photosynthesis correlate with the increases in atmospheric carbon dioxide due to fossil fuel burning. The result is that, up until relatively recent times (pre-industrial revolution), there was little change in the total mass of plants on land. That changed in the twentieth century, during which there has been an explosion of plant matter, with an increase of 31% ± 5%. Now as you can imagine, this has caused quite a flurry at WUWT. Deniers don't know how to handle conflicting evidence. For example, a common denier meme is that we humans are such puny creatures we cannot hope to have any impact on any aspect of the Earth system. Some deniers will even try to tell you that there's been no real increase in atmospheric CO2, or that if there is the 44% increase is so tiny it cannot make a difference. Yet it's also common for deniers to argue that an increase in CO2 is good, because CO2 is plant food. Now this is where you can see the toll being taken on Anthony Watts. He's been copying and pasting and publishing guest posts showing how climate change is real, and happening, and has consequences. He even put up two articles, both from his most extreme conspiracy nutters, who each said that Professor Mann won the show at a recent Lamar Smith hearing the other day. Here is evidence that Anthony is all of a fluster. He responded to this comment from Nick Stokes (of Moyhu fame). Anthony Watts' reply shows that he didn't bother to read Nick's comment, he was too busy trying to justify his stretch of a headline. Leading candidate…that’s a suggestion, tough noogies if you don’t agree with it, but I think the researchers are like you; they don’t like to look at positive aspects of CO2 enrichment of the atmosphere…its just all bad, all the time, hence the other language. He accused Nick Stokes of ignoring the very same text that Nick in fact quoted (Nick quoted it in its entirety, unlike Anthony who cherry picked the bits he liked). Anthony himself was the one who picked cherries, omitting the last part of the sentence about nitrogen pollution, whereas Nick put in the entire sentence and even added more for context. Our previous story, Study suggests increased atmospheric CO2 creates a 30% growth in plant photosynthesis during last two centuries look almost entirely different than this press release from the CARNEGIE INSTITUTION FOR SCIENCE on the very same study. What's different? Well I'll leave that to you to determine. There are some differences, but they are only emphasising different aspects of the study and the implications. They most certainly do not conflict with or contradict each other. PS - Once again, Anthony Watts didn't link to either press release. In his first article, he did provide a link to the paper in Nature. These are warmist, greenie wets looking for anything that limits the benefits. First line, first lie. Atmospheric CO2 has NOT been constant for the last 200 years until the 1950s when it is claimed that it started to rise. 80,000 direct chemical bottle CO2 readings show that CO2 goes up and down over the years, high during two periods in the 1800s and the 1940s, following the 1938 temperature peak and much higher than now. These people may have done some otherwise good science, but when they take AGW-related data on faith, they are bound to make food of themselves. 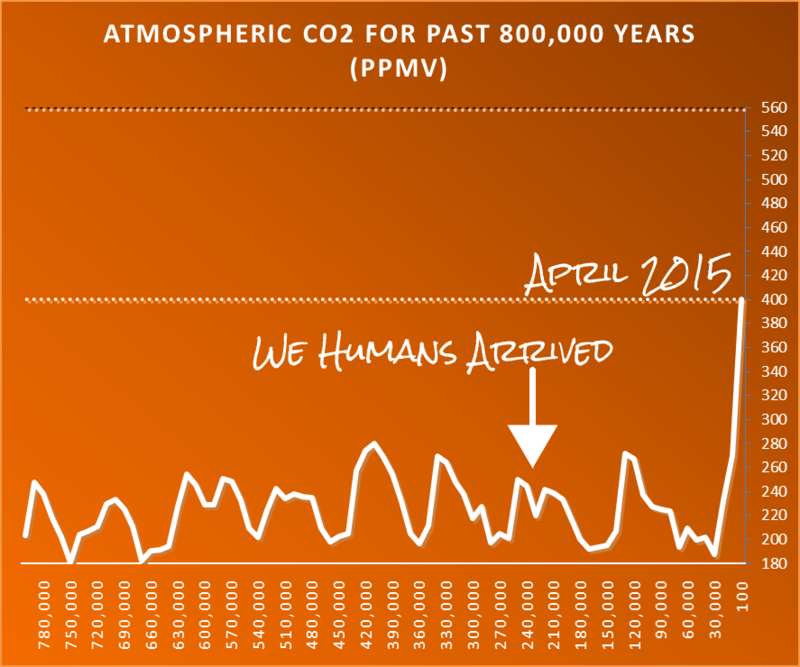 Here is a chart of CO2 over the past 800,000 years, derived from the EPICA Dome C Ice Core 800KYr Carbon Dioxide Data, and showing the level up to April 2015. (It's a bit out of date.) CO2 may go up and down over the millenia, but now it's just going up and up and up. Tom Halla seems to want to remove any reference to global warming from scientific studies that are related to global warming. The crew with this study felt a need to genuflect to the global warming is bad theme, despite any evidence. Maybe I was wrong about the parts that Anthony didn't like, or maybe this is more evidence that he didn't read his press releases properly. David A didn't read them properly. He didn't even read his own selected quote properly. David extrapolated, and didn't accept that even if plant matter continued to increase at the same rate, it's not enough to stop atmospheric CO2 from rising (obviously), and therefore global warming will continue. Lets see, every crop in the planet grows ( excluding other factors increasing plant growth) about 20 percent more food on the SAME land mass with NO ADDITIONAL water required. Plants are also more drought and heat resistant. Growing acerage increases. And this increase in productivity will continue to increase as CO2 continues to grow. Why is this unfortunate??? He's also wrong and, typical of deniers, relies on argument by assertion with no evidence. That's enough. The people who gather at WUWT are immensely stupid when it comes to climate change. Some of them might function (to a point) in real life, but their brains turn to mush when faced with science. Why does reading the WUWT comments make me recall the famous Ivan Pavlov? Good seeing you back, Sou. Regarding Higley7's comments, that's Ernst-Georg Beck's nonsense he's repeating. Multiple lines of evidence CO2 is so beneficial we should be burning limestone to raise levels to at least 1000ppm or so. Fossil fuels will only get us to 700ppm if we are lucky. You are confusing "multiple lines of evidence" with "fossil fuel industry inspired gobshite". Eric, have you seen this paper? "The LBNL study found a measurable negative impact on human cognition at 1000 ppm. The Harvard researchers had a more comprehensive study that found significant negative impact at 930 ppm." Seems in your case, at least that ~400ppm CO2 has the same effect. Brilliant! How hard can it be? Calcination of limestone is very endothermic. It takes around 4 GJ of heat to produce 1 tonne of carbon dioxide from crushed limestone in a kiln. Which indicates the energy needed for the calcination process alone to raise atmospheric carbon dioxide levels from 400 ppm to 1000 ppm is in the vicinity of 1 x 10exp13 GJ. Or an amount of energy that exceeds the annual energy use of the UK. 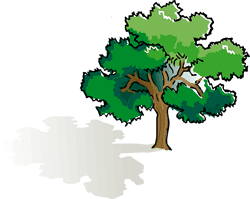 Spread across any number of years and countries, calcination aimed at achieving a photosynthetic nirvana would still require all or some sectors of an economy having to reduce their energy consumption, their production of materials requiring limestone, etc. The cost of all this? “100s of trillions” of dollars? But then you already know your suggestion is pie-in-the-sky stuff. In two words and a date, Lubos Motl - July 9, 2016. "Multiple lines of evidence CO2 is so beneficial we should be burning limestone to raise levels to at least 1000ppm or so. " Climate disruption aside (been there, done that ad nauseum and know that one cannot teach a stone), your claim that CO₂ is benefial at 1000 ppm shows extraordinary ignorance and/or deliberate mendacity. Some species of plants can grow at accelerated rates in high CP₂ if Sprengel's/Liebig's law of the minimum is addressed and all other limiting parameters are similarly bumped up to match. This can only happen in artificial environments such as glasshouses, so it's a bit of a moot point. Other species that are less-obviously constrained* by the law of the minimum tend to be weed species of no benefit to humans or to ecosystems, - and thus there's a bit of a problem there too. In most cases in the real world where plants have been constrained by CO₂ one finds that they respond slightly to the initial increased levels, and then reach a point where they no are longer limited by its concentration and therefore close their stomata in order to conserve water. And/or growth becomes unbalanced such that nutrition levels are compromised. Or growth benefits are offset by the direct negative impacts of planetary warming, or the indirect effects on the increased prevalence of pests and diseases. Atmospheric CO₂ concentration around 1000 ppm would see the Holocene climate entirely wiped out, would see probably more than 50% of Holocene species wiped out, and would definitely see humans as a technologically 'civilised' species destroyed. Such an atmospheric concentration would see the planet warmed at plateau** by about 7 °C above the Holocene mean, and the end result would likely be human extinction, or at best remnant populations living in stone-age societies. *All species are constrained by the law of the minimum, its just that some have different thresholds than others. ** "Plateau" would of course take centuries and perhaps millennia to manifest, so numpties like Eric Worrall might not be able to conceive of the planetary changes that would slowly but inexorably occur, but his inability to grok does not change the laws of physics and nature. I was thinking about this and started wondering how much of the increase in photosynthesis is due to more agricultural activity. It may be that there is more photosynthesis going on but if it's going into quickly consumed products it's not holding onto that CO2 for a long time so it has no effect on long term sequestering of carbon as you would get from a sequoia tree. I'm thinking of putting together a series on climate change, food and agriculture some time this year. There is a lot of good research happening and it doesn't get enough press. Plus, it's a worry. Given so much of the planetary surface is water, algal blooms may be a significant contributor. Reminds me of an excellent sci-fi novel by Gregory Benford, written in 1979. Prescient he was. In the near future, the biosphere has been all but destroyed by severe algal blooms. Scientists in the future figure out a way to send messages into the past warning those back in the 80's they are screwing up the planet. 'Nuff said. But that does not mean such a greener world will benefit humankind. You (or your descendants) will have to avoid being a casualty of the agriculture disruption, rising sea levels, more extreme weather, and the mass evacuations and forced migrations caused by parts of the world becoming too hot for humans to survive. Here in the UK, rapid population growth is resulting in a greyer world.